Even though Fort Missoula, located on the Bitterroot River, was built in 1877 for protection from the Nez Perce Indians, over the years, soldiers based at the fort saw very little military action. Only one real skirmish with the Indians occurred. After that the fort was used mainly as a training post. Beginning in the 1930s, The Civilian Conservation Corps (CCC) used Ft. Missoula as a district office. 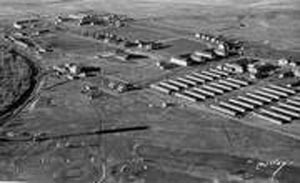 Then in 1941, partly because of its remote location, the fort was selected to become a detention center. At least 1000 Italian sailors were sent there in the fall of 1941, and later more than 1000 Japanese were also interned at Ft. Missoula. 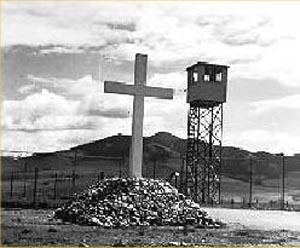 The CCC program was terminated in 1942 at which time The Ft. Missoula Detention Center was turned over to the U.S. Border Patrol who ran it for the Department of Justice during WW II. At various times during the tenure of the internment camp, a few German internees were also housed at Ft. Missoula—35 or more. One of these men, Karl Vogt, was sent to the fort during the summer of 1943, after his June rehearing, to await the OK from Washington D.C. for his parole.